Over 1,300 members of the agricultural sector responded to a survey organised by Farmers for Climate Action. Of those, 80 per cent called on politicians to do more about climate change. They want solid public investment in research, development and extension programs, for farmers to adapt to the increasingly volatile climate. A similar amount wanted agriculture sector representatives to do more to advocate for stronger action on climate issues. 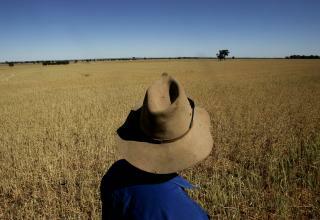 But not all farmers were comfortable with the idea of climate change, the survey found. It showed about 60 per cent of farmers believed in climate change, but the strongest motivators were observations of changing conditions on their own properties. “Eighty per cent of farmers acknowledge that things are happening on their farm: whether or not they accept climate change, that doesn't really worry them. Quite frankly it's kind of irrelevant,” farmer and climate science advocate Peter Holding told ABC reporters. “They're suffering more frequent droughts, less rainfall, more bushfires, increased weeds, and have made the statement that it's been happening with more regularity. While there may be a selective mechanism at play given that the survey commissioned by a group called Farmers for Climate Action, the fact that 40 per cent of respondents said they did not believe in climate change suggests the sample is hardly a monoculture. Mr Holding said opinions were simply shifting. “Five or six years ago, I would have said maybe 10 per cent of farmers were supportive of climate change and the rest agnostic or whatever you'd like to call it. Now it's up around 60 per cent,” he said. “We spent three days at Henty [Agricultural Field Days in southern NSW] and we asked pretty much everyone who came along [to complete a survey] and we got 500 surveys filled out. “In the past when I've done that, it would be unusual to go through the day and not be told off or abused, and that did not happen.